HTC Touch PRO2: SR 3290 (878 US $). HTC Diamond2: SR 2590(691 US $). HTC Touch HD: SR 3250 (867 US $). HTC Cruise2: SR 2390 (638 US $). HTC PRO: SR 2399 (638 US $). HTC Diamond Bundle (including car charger and additional battery) : SR 2390 (638 US $). HTC 3G Blue: SR 1999 (534 US $). HTC 3G Gold: SR 1599 (427 US $). HTC Viva: SR 1190 (318 US $). HTC Cruise: SR 1790 (478 US $). HTC P3300: SR 1199 (320 US $). Please note that these prices are without software (cash only, price for credit card may vary). 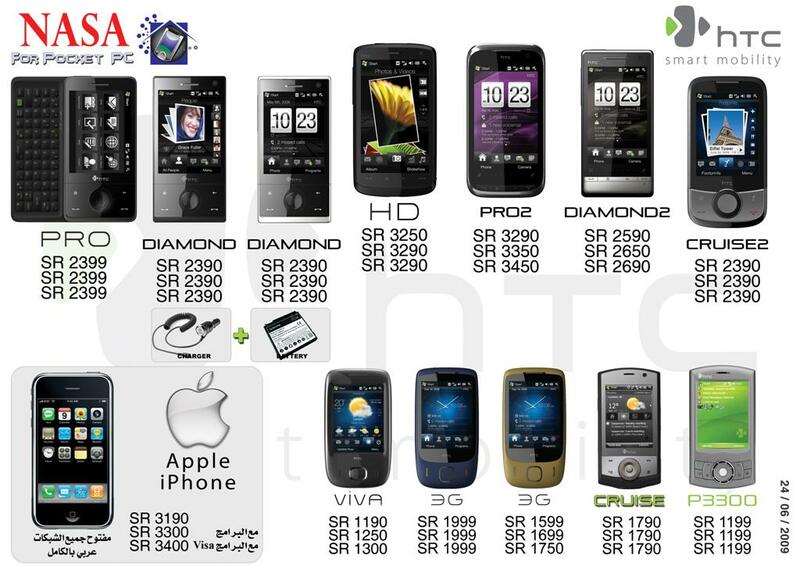 These all devices are available at Nasa for Pocket PC online shop (www.nasa4ppc.com) and all Nasa stores in Saudi Arabia. The US $ price is obtained by diving Saudi Riyal with US $ exchange rate 3.75, this may varry depening on currency market. This entry was posted in Pricing and tagged 3g, cruise, cruise2, Diamond, diamond2, HD, HTC, HTC Price, HTC Prices, HTC Touch, Iphone, Jeddah, Middle East, Nasa, p3300, p3600, PDA Prices, prices, PRO, PRO2, Saudi Arabia, Touch, Viva, اسعار الاتش تي سي by Yasir Imran. Bookmark the permalink.